Hari Raya is around the corner and I believe most of us, prefer to have healthy and yummy cookies. So, I created this recipe with Nestum cereal. 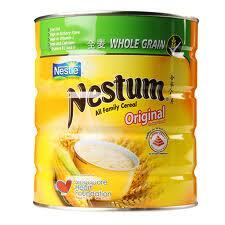 Nestum is available at any supermarkets and easy to bake for those with less or no experience. 1. Whisk butter and brown sugar till fluffy and smooth. 3. Mix flour and nestum alternatively till dough is developed. 4. Leave it for 5-10 minute. 5. Butter the tray and place the dough according to your desired shape using cookies cutter. 6. Bake in preheated oven at 120 Deg C for 10 to 12 min.